Welcome to my first Incredibles 2 "Junior Supers" review! This is an adorable new range of toys from Jakks Pacific and I'm excited to get into all the details with you. 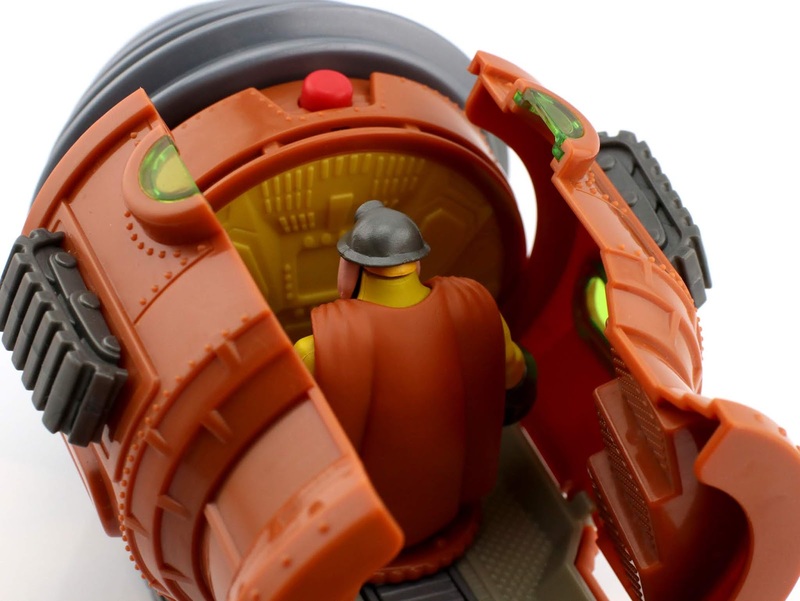 For today's post, I decided to start with the Underminer's Tunneler Playset/Vehicle, but keep in mind that there is a lot more where this came from and I look forward to reviewing the full collection right here this week leading up to the film's release. First I have to say, I LOVE this line. Stylized "chubby" mini figures are some of my favorite toys to collect and I was thrilled when I saw that characters from Incredibles 2 were getting that treatment. Whether it's last year's Coco Skullectables, the Cars 3 Mini Racers, the Finding Dory blind bags, the Toy Story Buddy Packs or the Monsters University Scare Pairs (etc., etc), I've been drawn to this style of figures for a long time (dating back to at least 2001 with the Star Wars Galactic Heroes line). 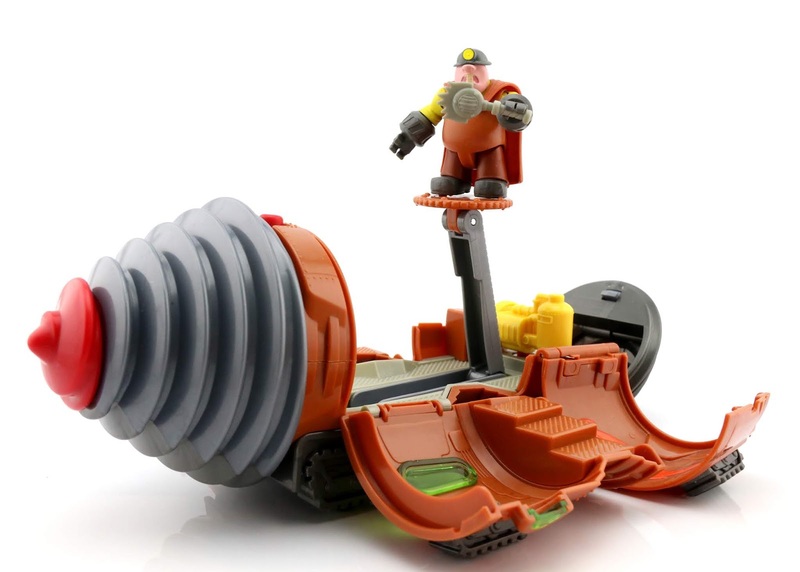 And not only that, but I'm also a big fan of coordinating playsets and vehicles with fun play features—so yes, this combines all of that into one awesome toy and it's incredibly fun. There's so much to love about this playset. Let's lake a closer look at it out of the package and I'll take you though all the features! There is a ton of play value with this set and lots of room for imaginative play as well. First off, let's talk about the size. The vehicle itself is about 12" long and 4.5" tall. 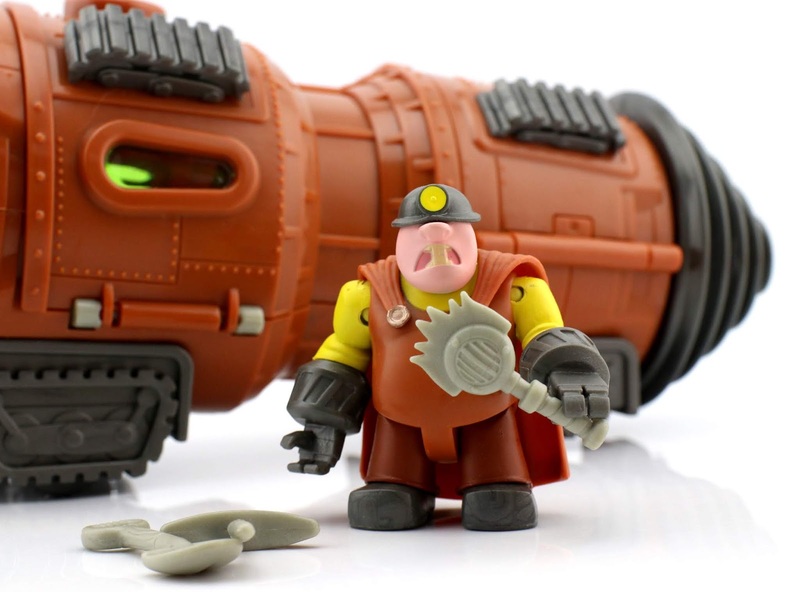 The Underminer figure is about 2.5" tall and comes with three accessories: his microphone, a shovel and a pick-axe. A launching projectile (the red tip of the drill) and a launching yellow boiler are also included. 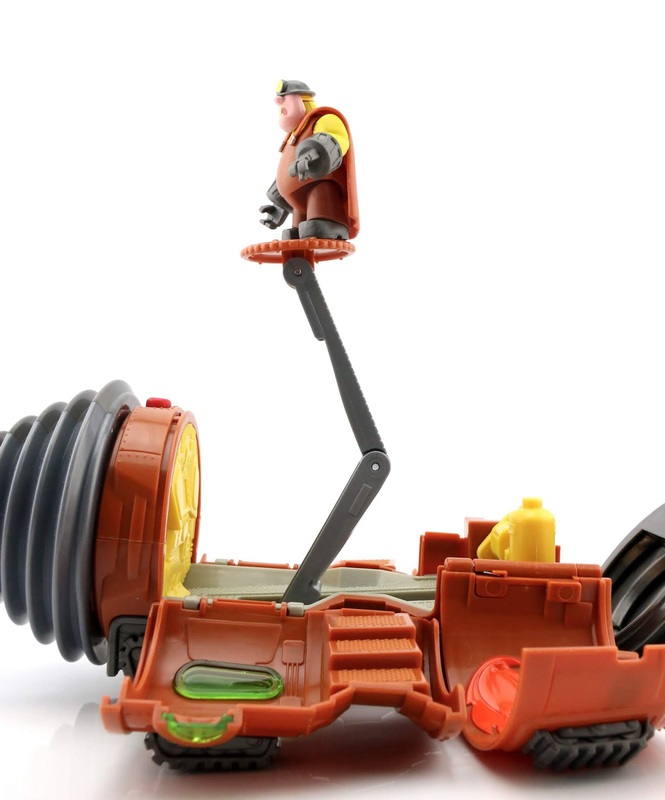 FEATURE ONE: The drill spins when the vehicle is rolled! 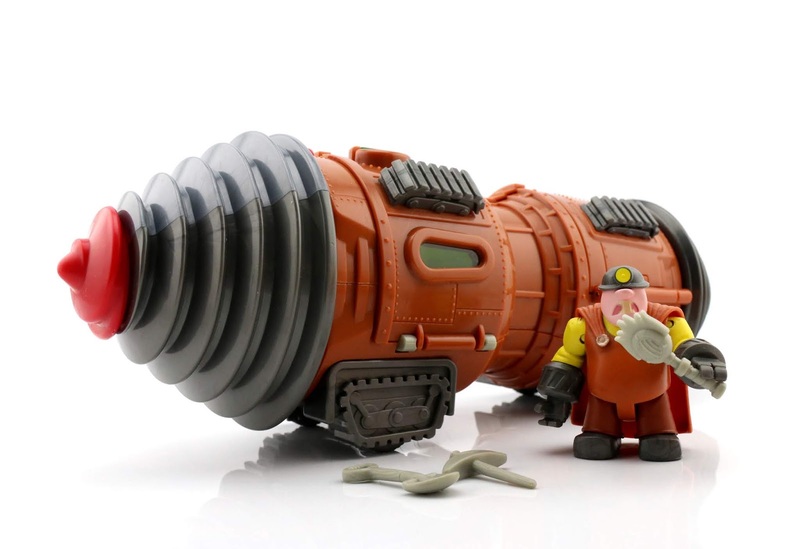 I love this and was totally hoping for something along those lines when I first saw this revealed at Toy Fair earlier this year. You'll also notice that the drill bit is two colors, which is very clever since that helps the eye better distinguish the rotating motion. 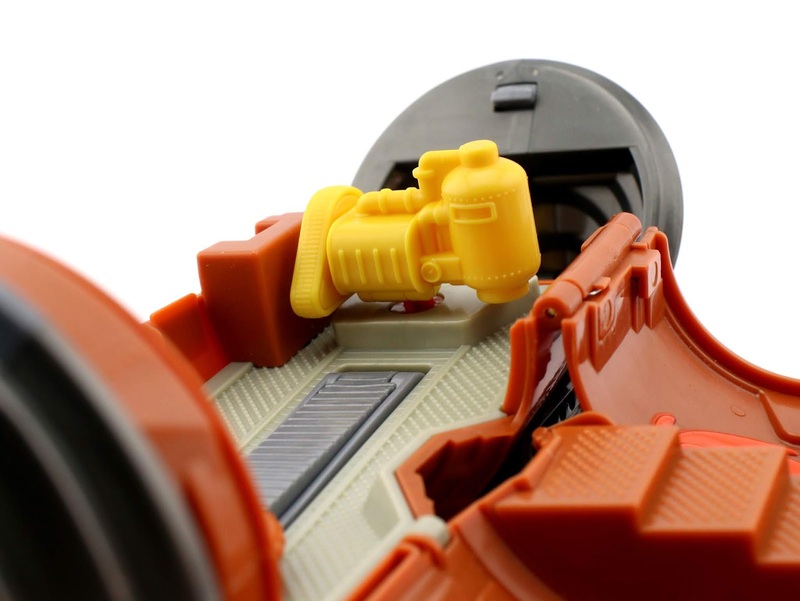 FEATURE TWO: Press the red button on the top to launch the drill's front projectile! Careful—this thing has some power to it. Side note, I really dig the green tinted windows. What a nice little detail. Here it is all opened up! 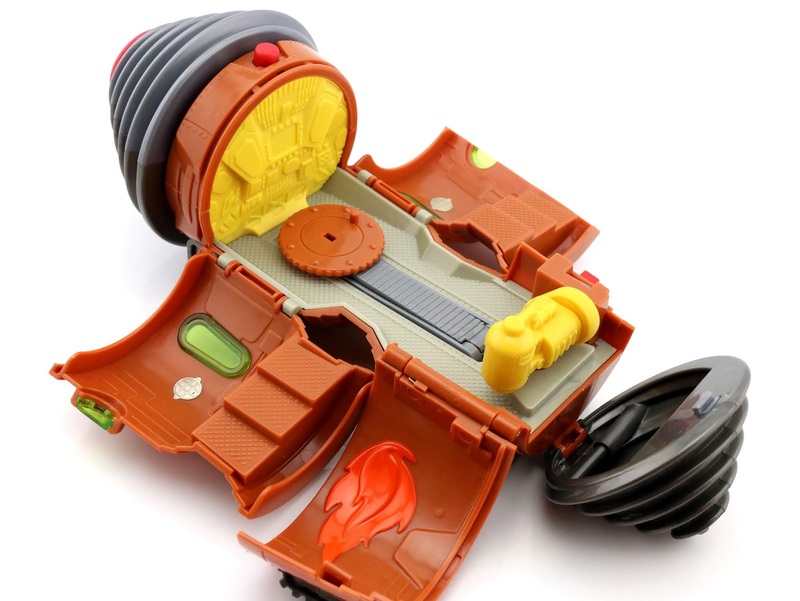 The molded control panel and fire graphic (to represent the "boiler room") are also both neat details. Very well thought out. I like the steps on either side too. 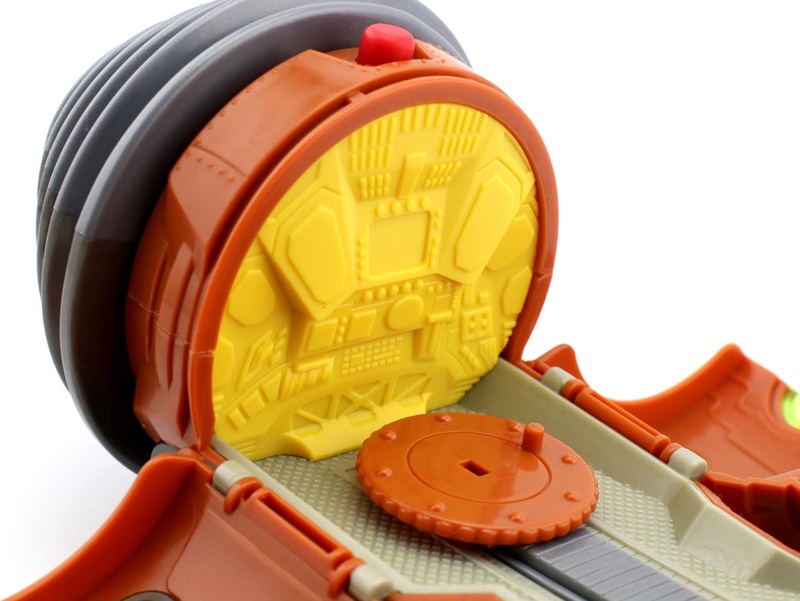 FEATURE 3: Press the red button there on the side once (softly) to open up that portion of the tunneler. Press it again (harder) to launch the "boiler" (simulating some kind of explosion)! If you press the button hard enough the first time, that'll open that area AND launch the boiler simultaneously! 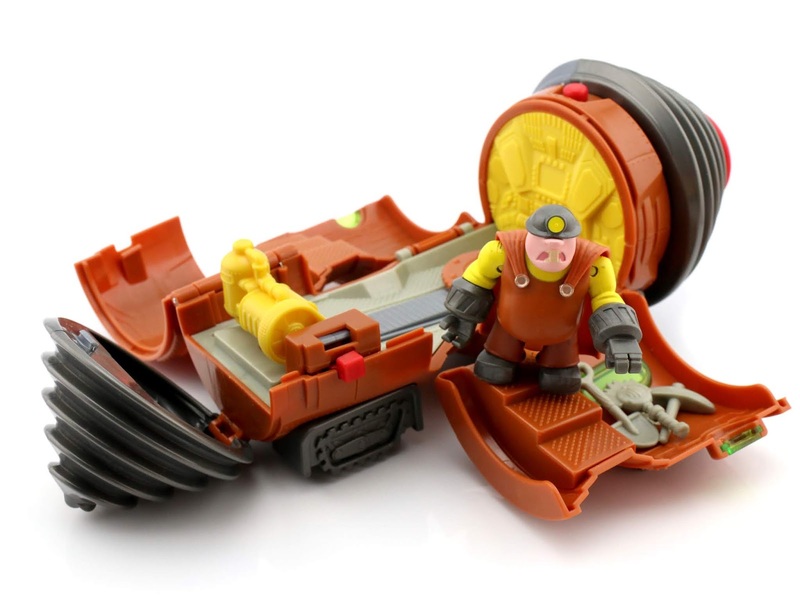 FEATURE 4: The rise of the Underminer! 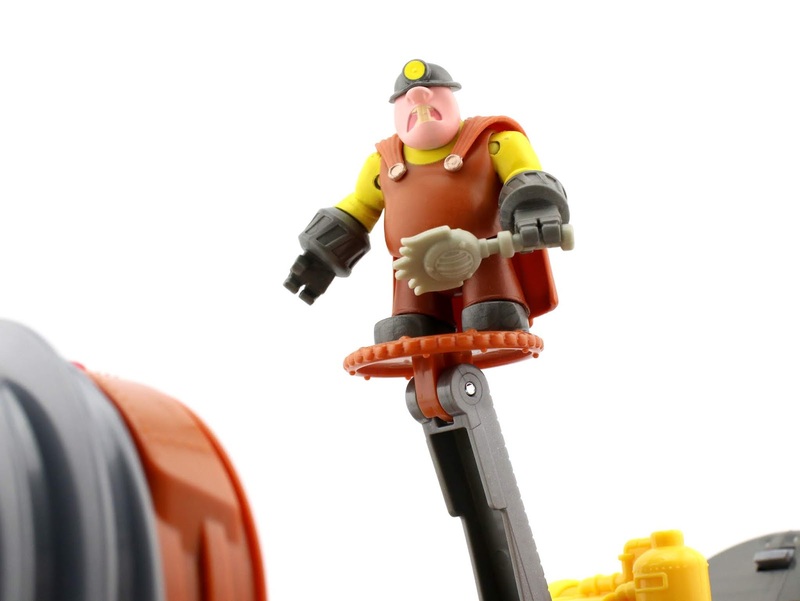 Insert the Underminer's foot into the peg on his signature platform and extend it to whatever height works for you! This is perfect for reenacting the scene from the film. It can go pretty high too—just over 6". Fold the platform back down and it goes right back into its designated spot. You can even keep the Underminer right there on the base upon closing this thing up too. It's designed for him to fit perfectly in there while standing up. Check out the official video ad for this toy HERE to see a brief overview of all the features in action. 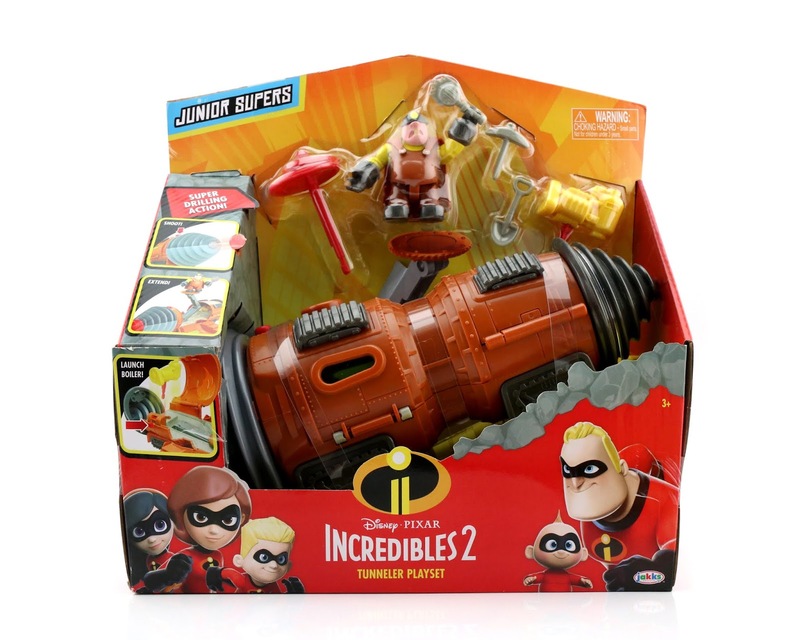 If you have a little Incredibles fan at home who's excited for the film (maybe ages 3-7), you will most certainly want to pick this up. It has my highest recommendation and I can't think of anything bad to say about it. 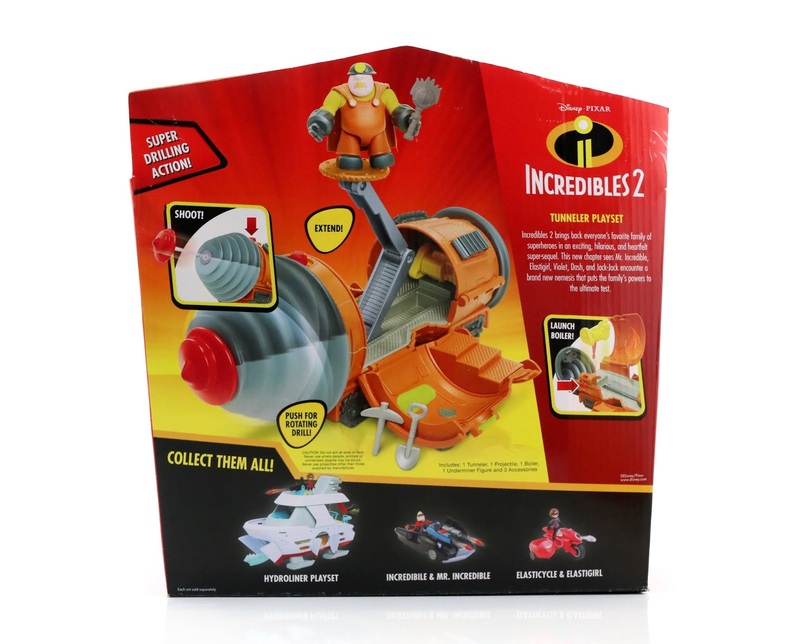 If you like toys like Imaginext, you will love this and the whole Junior Supers line. Pick this up at Target or Amazon using the link below! Retail is $24.99. If you still have any Toy R Us stores open near you, you might be able to still find it there and on sale. A HUGE thanks to Jakks Pacific for sending this over! Please let me know your thoughts or any questions you might have about this down in the comment section. Check back tomorrow for more!